Note: I wrote this in 5.0.4 before the launch of Mists of Pandaria. I’m using it now as filler! I know none of this is going to really matter in a couple weeks, but I noticed something kind of funny with 5.0.4. I use AskMrRobot to determine what gear is best for raiding. Because I wasn’t raiding normal mode regularly, I had it set to LFR. With 5.0.4, what was valor point gear is now available for justice points, and what was conquest point gear is now available for honor points. Good raiding gear comes from raids, but good PVP gear came from conquest. Because of this, there was a bunch of new PVP gear I could purchase (because I don’t do arenas or RBGs), but nothing I needed with justice. Then I noticed something I wasn’t really expecting on AskMrRobot. Because I now have access to good PVP gear but only do LFR, AMR was suggesting two pieces of PVP gear as the best gear for raiding. 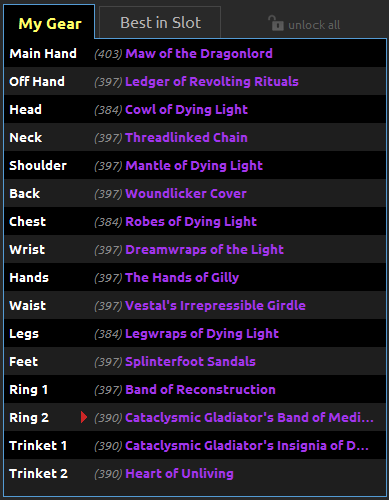 The “Ring 2” entry, Cataclysmic Gladiator’s Band of Meditation, has a red arrow indicating it’s not BiS, but the ring it wants me to use requires being exalted with the Avengers of Hyjal (and I’m not). Anyways, this seemed pretty funny to me. Regardless, all this gear will be old soon.